Felix Picherna, a famous DJ from Buenos Aires, upon his return from Europe, where he had spent many years, remarked that “In Europe, I’ve learned to appreciate Canaro’s music”. Indeed, Francisco Canaro has much wider exposure in Europe, compared to Buenos Aires, or US/Canada. And, thinking of Canaro, the first tango that comes in mind, is, of course, the immortal “Poema”. 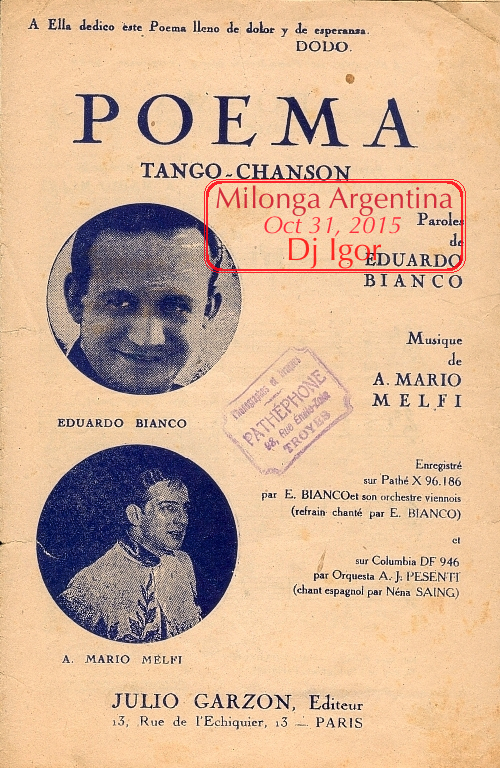 Interestingly enough, the birth place of this tango is neither in Buenos Aires nor in Montevideo, but somewhere on a road between Rome and Berlin. Argentine tango was introduced to Parisian aristocracy as early as in 1907 (see “Tango Stories: El Choclo”). After the end of the World War I tango has spread all across Europe, Russia, and Japan as well. One of the most prominent figures in European tango was Manuel Pizarro. In early twenties he directed, simultaneously, 5 (five) orquestas operating under his name in major European cities.